Within a span of a year, his priorities changed frequently and consistently. When he was in a dead-end relationship, he loved her more than he ever had before. She was his priority and nothing else mattered. But, then she left him. Although, he was emotionally damaged, he tried to focus on his new job. After a few months, his priority became his career. He wanted to achieve something and prove himself. But, the reason behind this thrive was mislead. This is why his job became monotonous for him. He became really good friends with a girl who understood him more than he did himself. But, at that time, he ignored her and prioritized his friends. He also told her how he had to focus on his career when he clearly wasn't doing that either. Then, the friends who were his priority left him. Then he realised he should've held on to the girl who loved him. And now that he wanted to prioritize his relationship, she was long gone. When he should've prioritized his career, he prioritized his meaningless relationship. When he should've prioritized his friends, he prioritized his boring job. When he should've prioritized his true relationship, he prioritized his fake friends. 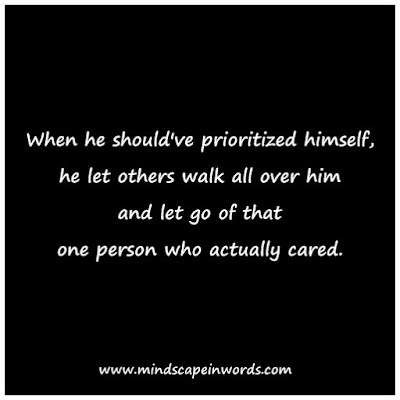 When he should've prioritized himself, he let all others walk over him and let go of the one person who actually cared. Maybe that's why, you should just keep yourself as a priority rather than being others'. Love this! It seems like sometimes we can't get our priorities straight. It's such a hard balance sometimes. 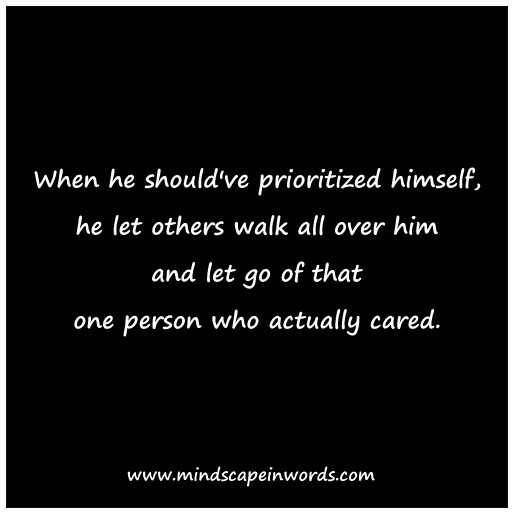 In my opinion, we need to learn to prioritize ourselves in a way that we can still "prioritize" others, while still keeping our sanity and still taking care of ourselves. What a great little lesson! 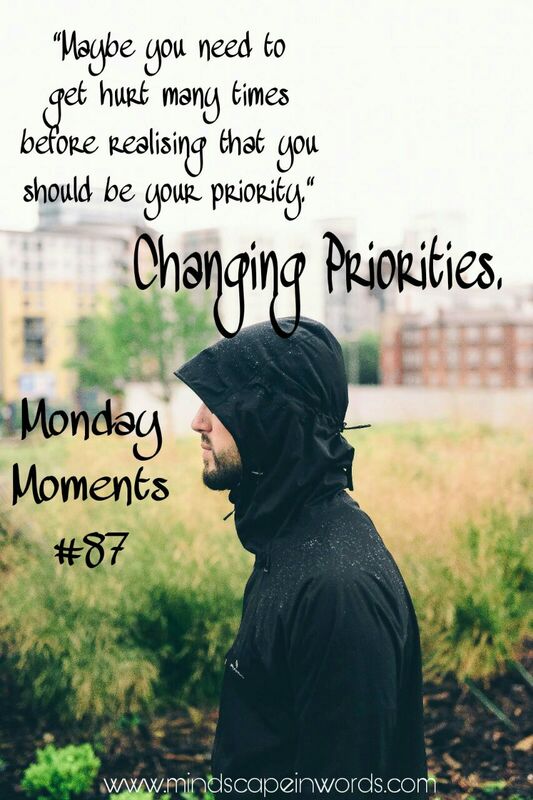 I definitely agree that we need to be more of a priority to ourselves than anyone or anything else!